Release notes supplied alongside today's iTunes version 12.5.3 release contain a list of changes identical to those introduced last week. In particular, both updates address issues that in some cases caused albums to play back in the incorrect order, as well as a problem that prevented lyrics from displaying while listening to Beats 1 radio. The lack of new change log notes suggests the latest version of iTunes includes minor bug fixes or extends compatibility to a wider set of users. iTunes version 12.5.3 can be downloaded for free from Apple's iTunes webpage or via Software Update on Mac. The last major iTunes update came in September with iTunes 12.5.1, which debuted a slew of aesthetic and behind-the-scenes upgrades to coincide with the release of macOS Sierra. 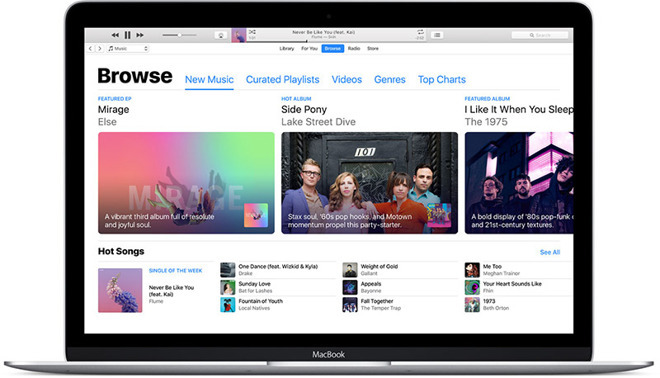 Notably, Apple Music in iTunes received a facelift commensurate of similar changes applied to the Music app in iOS 10, support for Siri on Mac and picture-in-picture viewing.